In order to understand how to care for this strange flower, you need to know how he used to live in nature. This is not an ordinary flower with the usual roots, living in the earth's ground. It is a flower-clothespin, it grows in cracks in the bark of trees and rocks, in marshes, and some species even under the ground. In our homes, the phalaenopsis orchids took root. They belong to plants-epiphytes. They are unpretentious to the presence of soil and can grow even without it in limbo. But they are very demanding of light and moisture, because their natural habitat is the tropics. Their roots are conductors of moisture for the whole plant from the air. And yet, the excess of moisture is disastrous for an orchid. In such conditions, its roots are mostly in a soil free from the ground and "save" the whole of the rooting part. What are the conditions necessary to create this gentle beautiful flower, from the moment when it gets to our house? On the one hand, it is not difficult to care for an orchid, but it will be capricious if you do not follow certain rules. Once you brought the orchid into the house, do not rush to immediately change it and look for it a permanent place. She should get used to the new habitat as calmly as possible. Let him stay in the same pot, and stand where there is not a lot of light, it's not hot and there are no drafts for several days. You do not need to water it yet. And although many advise not to transplant the orchid into another pot without the need for even a year, it will be better to still transplant her days in 5-7. Why? Usually in the colors purchased in the roots to conserve moisture there is moss, fragments of foam or "cups", preventing excessive wetting. Both are best removed earlier in order to avoid damage to the root. For the transplant, you need a transparent pot with holes or a glass smooth vase - this will depend on the humidity of the room in which your treasure will live. As the experience of orchid lovers shows, in closed vases with low humidity in the house - and this is more common - the plant feels better. Therefore, today we will consider the rules for transplanting into a pot without holes. Lay out the soil: claydite, so as not to block the roots (about a fifth of the volume); moss sphagnum, which removes bacteria and retains moisture; bark of pine in large fractions; special primer for orchids. In the middle of the vase we place the roots of the flower, fix it with pine bark so that it is stable, and wake up a little more soil. On top again we put bark and a little moss to prevent drying out. It is very important: before planting check the roots for the absence of rot and thoroughly clean them from the former soil. After transplanting the days after 5, make a tropical rain shower - put in a bath, pour the leaves of the shower with running water from the shower, and fill the vase with it to soak the soil. After 20 minutes completely drain all the water, gently tilting the vase and holding the flower by hand. Be sure to blot the joints of leaves and stems with a paper napkin. Then we pour water with half the recommended supply rate. We pour so much so that the clay is covered. In the case of a pot with holes, we make impregnation by placing it in a container. When the soil gets wet well, the water will flow freely. This shower can be done a couple of times a year. The temperature in the room should be 15-18 degrees at night and in the daytime up to 28 degrees. Close from direct sunlight, but do not spare stray light. Keep away from drafts, air conditioning and heating. Water only the soil, not the leaves. If necessary, moisten the air above the flower and the leaves on the back. Feed once every 2-3 weeks during the period of activity. Transplant once every 1.5-2 years in spring or autumn. 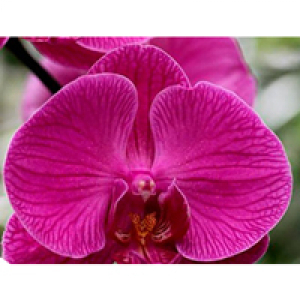 If the orchid with proper care for a long time does not bloom, create it stress. Place not a couple of weeks in a dark place and do not water. When you return it to the light and moisturize, it will please you.